If you have a toddler, you might be thinking about if preschool is right for them. There are many benefits to preschool and today we’re going to talk about just a few of them. If you’re looking for preschool or daycare services in Huntington, look no further than Rainbow Chimes Daycare. Our teachers are passionate about providing a nurturing learning environment for children, and their degrees and credentials back that up. 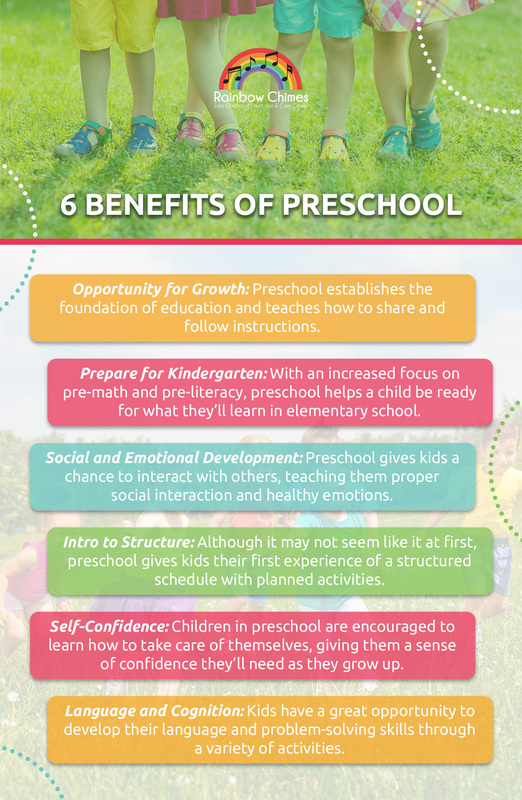 Without further ado, let’s take a look at some of the benefits of preschool. Preschool provides children with their first experience within a structured setting. Many kids when they’re very young have only interacted with their family members, so preschool presents a situation where they’ll get used to speaking with both other kids their own age and adults like their teachers. This will also be an opportunity to learn how to share, follow instructions, and set the foundation for their academic future in elementary school and beyond. As preschool begins to shift towards creating a strong academic foundation, children will be taught the pre-math and pre-literacy skills they need to grasp future learning concepts. However, great preschools don’t forgo playtime and creative expression in favor of strict education. Instead, they provide a little of both. When kids get overwhelmed, they don’t retain information as well, so it’s important that preschool gives them a balance of schoolwork and play. Not only does this early childhood education help them absorb what they’ll learn in kindergarten more effectively, the chance to play with their new friends has other positive effects, albeit ones that don’t necessarily show up on a report card. With a new environment and new people to interact with, preschool is vital to a child’s development of social skills. They’ll have a chance to learn about sharing, communicating their needs, understanding the needs of others, and other important social cues they’ll need in the future. Likewise, they’ll be able to form a trusting relationship with an adult outside of their family with their teacher. This will help them understand how to respect and listen to people that aren’t just their parents, so they can absorb the information taught that day. All of this will also help them develop healthy emotional self-control and empathy for others. While from the outside preschool might not look that structured, that actually isn’t the case. In fact, preschool provides children with their first experience within a structured environment with scheduled activities. With that said, it doesn’t mean that a preschool teacher is constantly directing the activities of the day. In high-quality classrooms, the structure will be essentially invisible to the kids. Instead, the teacher will just provide opportunities that facilitate play, social interaction, and learning. When a child enters preschool, their communication skills are still developing. Between the ages of three and five, a child’s vocabulary is expected to grow from 900 to 2,500 words. This allows them to form longer, more complex sentences as they learn how to properly communicate with others. Through activities that teach about science, art, and storytelling, their language skills will develop with new words on a daily basis. Those activities will also engage their problem-solving skills and the ability to understand information. They’ll also develop their ability to think logically, which will be very helpful as they advance through school. Preschool can have a wide range of positive impacts on a child’s early development. From giving them the skills they’ll need to be successful academically to the abilities to make friends and practice good manners, it provides a great foundation for many aspects of their lives. If you would like to learn more about the preschool program at Rainbow Chimes Daycare, call us today. The school year is just around the corner, so this is the perfect time to get prepared!